Usually said to derive from "Hanging Wood by the Ford", the name of Hungerford may come from the Danish King Hingwar (alias Ivarr the Boneless) who shot Saint Edmund, King of East Anglia in AD 869. He was said, by the 14th century chronicler of the Book of Hyde, to have drowned at Hungerford ("Hingwar's Ford"). Hingwar was on his way to meet the Saxons in Battle at Ethandun, said to be nearby Eddington (though almost certainly Edington in Wiltshire). This was the last decisive victory for the Saxons, and the Danes were driven out of southern England forever. The English celebrated this annually at festivities known as Hocktide; and though few places remember this festival, Hungerford does. The festival was traditionally associated with the payment of rents, which could stem from the paying of the "Danegeld", the money given to the Danes to encourage them to leave English shores. However, as will be described shortly, the Hungerford festivities are supposed to stem from elsewhere. Eddington and Leverton are both easily identifiable in the Domesday Survey of 1086, but Hungerford less so. It appears as one of the three manors of 'Ingleflod,' a large estate which covered most of what is now western Kintbury. The name survives at Inglewood. In Hungerford, the name became Ingleford, but was changed to Hungerford when the 2nd Earl of Leicester founded a borough or 'new town' there sometime before 1173 (probably before 1118). The 'hunger' part presumably indicated the surrounding land produced poor harvests. 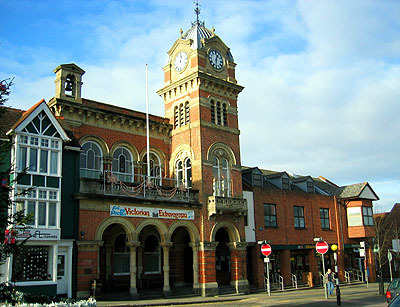 The town is remarkable in retaining its original burgage plots lining the High Street, which are easily recognisable from the air. In the 13th century the town was known as Hungerford Regis (Royal Hungerford) and it passed from the King to the Dukes of Lancaster. John of Gaunt, the great 14th century Duke, thus became associated with the town. He apparently gave the townsfolk the right to fish in the River Kennet, a jealously guarded privilege. They received his horn and a charter affirming his gift, but the latter was stolen in the reign of Elizabeth I. The Duchy then tried to re-establish its rights over the river and a famous court case ensued. The matter was only finally resolved when the Queen herself intervened on the town's behalf. Hocktide is said to celebrate the Duke's patronage every second Tuesday after Easter. The town-crier blows his horn and a Hocktide Court is held in the town hall in which all commoners, those living in the most ancient house in the High Street, must pay a fine to ensure their rights of fishing and grazing. Hungerford is unusual in having kept its medieval street plan, as laid out in the High Street in the 12th century. The houses of here still maintain very long and narrow strips of land trailing perpendicularly backwards. It looks quite dramatic from the air. While the court continues, the "Tutti-Men" with floral decorated poles are led through the streets by the "Orange-Man" to collect kisses from all the ladies resident in the High Street. They receive an orange in return. There are various traditional suppers, ale-tastings, lunches and balls. Safe to say, everyone has a lot of fun. The Bear Inn in Charnham Street is known to have been a hospice as early as 1464. It may have been connected with the Hospital of St. John, established in the same area by King Henry III. Elizabeth I visited the inn and her coachman is recorded as having died there. 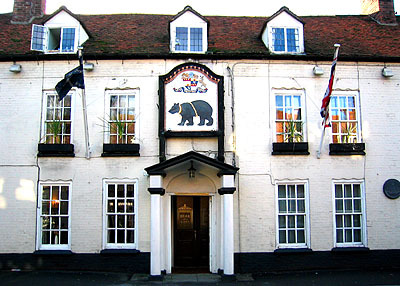 Later, upon his retreat from the Second Battle of Newbury (1644), Charles I used the Bear as his headquarters. For three days he stayed in the town with some thousand troops. Originally, he had been heading for Basing House (Hants) but, when news arrived that his help was not needed there, he marched back to Faringdon. In December 1688, the Protestant William of Orange (the future King William III) was staying at nearby Littlecote House, on his march from Torbay to London, when he arranged to meet the commissioners of his opposition, the Catholic King James II, at the Bear Inn. They were keen to know his intensions, if not to secure his retreat, but were privately told it would be best if his uncle, King James, were to flee. A plaque records the details. The gift of a Red Rose is still presented outside the Bear to the reigning monarch on their first visit to the town. Hungerford became quite a stopover for troops. The year prior to the Second Battle of Newbury had seen the First Battle. Parliamentarian soldiers were stationed in the town not long before. Having had a clash with Prince Rupert's men at Aldbourne Chase, several of the wounded died in Hungerford and their burials are recorded in the parish register. Troops of Essex and Manchester were again in the town before the Second Battle and the Hampshire Militia was stationed there before they were called to join Cromwell after the Battle of Worcester.